2017 – Do The Thing! Appearances, Performances, and Great Honours. The Long-Awaited new non-guest blog post! Well first of all you’ll notice I’m doing this on my rarely-used-these-days blog page. Perhaps that’s a sign of something in itself? Probably not. Try not to read too much into it. So 2018 then? Well, I’ve got very mixed feelings about it, which I’ll get to with a bit of preamble. The main thing is that it showed signs of improvement in the final quarter, which I need to carry into 2019 at full speed. But to really nail down where I’m at with it, I guess I’ve got to talk a little about the last three. You haven’t seen me much on this blog page, and I think I can briefly explain why. Anyone around me in 2015 will know that it was the kind of nightmare for me one can only wade through, and truly kicked of a patch of total awfulness, some of which remains under repair. Mostly autopilot through that and into 2016, which was somehow arguably worse. 2017 was not great by any means and ended on a rough note. That led to starting 2018 with a Grand Tour. If you ever need anyone to stress test your suitcases I’m probably a good bet. Think I got through four of them in total. I spent most of January in Stoke recovering from a bout of fatigue I didn’t even know I had until I worked out the headache and entire days in bed *might* have been related to this. Thanks to Farah and Edward, Miles and Ivan, I got through to the next stage. I spent some time in 1987 in an excellent LARP I managed to attend because I have amazing friends. I have more thanks to that weekend, not to mention a fresh spin on With or Without You, We Are the Champions (for the first time this year) and We’re Not Gonna Take It . These days the Void is conversational when screaming into it, which is a reasonably positive development. I had another year whereby I was not exactly prominent in LARP areas but got to some great stuff. The tour itself ended up being a lot of bouncing between London and Manchester thanks to a bunch of great people keeping me moving. I’ve had a great base in the last few months thanks to two in particular. And I’m never short of pet company either. So the less good things so I can get them out of the way. Had a miserable year of job hunting frustration overall. Biggest interview I had did everything they could beforehand to ensure I was wracked by nerves, which isn’t me in interviews at all. The real kick though has been that on at least four occasions, I got as far as interviews, and then the employer disappeared off the face of the earth as far as I was concerned, no matter what approach I took to chasing up. I’ll politely say other aspects of my life have been remarkably similar without getting into detail. Also, just as I built up a bit of writing momentum in the second half of the year, I had it rather dramatically swatted away by something out of my hands. I have a couple of potential solutions in place but only time will tell how that one pans out. However I’ve a good chunk of the Grenshall Manor Chronicles book 3 drafted, and I think the finished work will be fine once I have polished it to what it needs to be. I had plans for a fourth book, but they have altered quite considerably. More on that some other time. Get me a drink first. And one particular loss hit me very hard this year, and a few others in one of my little gaming community. A really good person gone far too soon, but certainly not forgotten there. We’re seeing to that. 2018 is a year I’ll remember for letting go of some rather unexpected things I was close to. But the saying goes, as one door closes, another opens. I’ve had a bunch just slam in my face as I was walking too, but in a few cases, just end of an era, or an enforced change I didn’t necessarily see coming. It’s okay; just required deep breaths and a bit more of a plan going ahead. So, good things. I have managed to do pretty well for conventions this year. Eastercon in Harrogate was great, though I have unfinished business at Betty’s Tea House as I didn’t make it while I was visiting, and also the guest house I stayed in was fantastic, complete with fresh baked bread at breakfast each morning and a brilliant room mate. I’ll be honest, he’s a regular for me on that front and we’ve been friends just about half my life now, but that’s just an additional bonus point, David. Nine Worlds I’ll mention because I’m pretty sure I had a great time, great company and I have learned so very much in the programme role I worked on in the two years I was doing it, and made yet more excellent friends. I step down from that spot happy in the knowledge that I have some great stories to tell from there, and experiences that I can take elsewhere to other capacities. It’s been emotional. And Fantasycon, whereby I am one of the Redcloak volunteer staff, as well as happy panellist. I’ve got myself a little con family there, which is just amazing and far beyond any possible expectations on my part. I’m certainly looking forward to the 2019 adventure there! There were a couple of other LARPs, both of which down, once more, to really lovely folk who helped me to get along. The Danger Market took me back to the 60s as a spy, and cosmetic factory employee, in one of the most fun opening acts I’ve had to an event yet. Players believed I was crew for quite a while, so evidently did my job! Most recently, I attended the second run of Returned, which was wonderful, terrifying and every other kind of entertaining in between. Well, I don’t have a huge amount of power to poke the things blowing up around us all at the moment, but behind the scenes prodding is something I occasionally do very well, provided I can find the right buttons. So I can assure you I’ll be looking. MPs have been spoken to, petitions signed, and other letters written as well. I might not talk about it that much but something affecting us all so also doesn’t find itself easily ignored. I haven’t had the space to set myself any goals or targets in recent years: once I’ve stuck at the top of the list, ‘GET THROUGH IT’, that pretty much took up the entire page. Hopefully personal focus will move slightly away from emergency survival mode protocols and more into featured activities, though thanks to the loveliness of others I have still managed to turn up to things. This part has a good schedule already, with Worldcon being held in Dublin and having my fond enthusiasm for some time now, and of course more than delighted to don my Red Cloak once more. I intend to play more cards, continue to hang out with excellent people and all of that fine stuff. However note that I’ve taken on at least one small writing project for life after book 3, which you will see in some capacity in 2019, sorry for keeping you all waiting, but I can assure you it’ll be worth it in the end. I’ve laid the groundwork for some new projects, including a different urban fantasy universe, something a little more historical; something a little different, and a more space-shooty thing which I’m more than enthused about and will be delighted if sees the light of day. I’m also going to be jumping on more short stories because I enjoyed the bug I got for a few I did this year. Didn’t get published unfortunately, but at least they got out somewhere. Long-ago followers will know how much of a big thing that is given my third paragraph on this post. Oh, yeah—I’ve taken on editing an anthology as well, which you will know much more about as 2019 unfolds. Unexpected? Yes. Exciting? You bet. And as well as new faces, I’ve made some contact with some of my classic friends too. This is on one hand long overdue and on another, timely. You’ll see! So here I am, raising a glass to what has gone, to the wonderful people I have, and to what is to come. There are some gritted teeth in there of course, but if I can get half of what I’m planning to done, I’m already eager to give you that review this time next year! This is before we even get into the thing I’m enquiring about that some of you already know about. Good luck to all of you out there who have read this, and thank you for everyone who has had my back up to now. There aren’t enough words to express quite how much I appreciate it. It’s funny how the lightest of gestures can become something much bigger whether by accident or design. For me, the last two years have felt somewhat lost to me for the most part, with personal circumstances meaning at times anything beyond getting through the week in one piece was pretty much off the table. Things remain off-track, but have at least settled enough to take a few deep breaths and work out where to swim to next. In the last few months, some pretty good things have turned up, including a chance to portray a fascinating historical figure in front of a museum audience, but that is a story I shall revisit another time. Earlier this week, I had something crop up I could only consider a massive opportunity, but of course it was then that the weight of self-doubt landed on my head. So I decided to do what any person with such reservations would do. I took to my personal Facebook page, of course. The response was…pretty good. And further to that, I’ve seen several friends ready to Do The Thing, or already doing it, this week. So it felt like something I should probably at least partially look after, or champion for the time being. Here goes! First of all, I would like to thank Emily’s Diary, for bringing this wonderful and encouraging tiny potato into my life. It’s always handy to remember when one forgets. Secondly, I should probably stick down the list of known planned attendances this year, and also planned activities which might affect the year’s movements. Should there be anything you readers see that you either think I should probably be at, or would perhaps like to see me at, you need but let me know and I’ll add/check the diary/tell you I’m double booked at earliest convenience. And of course, some of these will be subject to change or cancellation on my part. Finish and release Winter Storm. This is a priority task, having not managed in 2015 or 2016 for enough reasons to cover a very personal blog post which I’m not going to be doing. However, know that words are happening again, which is the start you always need with stuff like this. I am also doing my damnedest to make sure it’s worth the wait for you all. Should that succeed, I do have the first of a new series to draft. I won’t be done with the Grenshall Manor Chronicles by any means, but this thing is something I’ve been talking about and sketching ideas for when I’ve had five minutes of late. It’s a very different setting from what I’ve done so far, and it needs to happen (at least for me). I won’t get ahead of myself, but if I got this far, I’d be very happy. There is a possibility of short stories in and around this time. No promises to myself or others, but if the opportunity presents itself, both in terms of my time and a place to put it/them, then activity shall happen. Third, and finally, as previously stated, my task appears to be to wave and encourage people to Do The Thing wherever appropriate and/or possible. I shall start here. And know that of course the definition of Doing The Thing is an intentionally broad one. It doesn’t have to be rulership of a global power. As I mentioned earlier, sometimes there are days when making it out of bed should be celebrated as the triumph they are. Only you yourself will know what you can do, and want to get done, on a given day. But know this: I’m going to do my best to be there for you in spirit, and if you want to tell us about The Thing you are doing, please feel free to comment away below! I’ll also designate this post as a permitted spot for getting hold of me and checking on progress with the things I have listed above for myself. Know that this isn’t necessarily an exhaustive list of missions I happen to have for the year, but it’s an important enough list for me all the same. To those of you out there who are going for it, I wish you the very best of luck, and look forward to hearing tales of your victories and your valiant deeds. I’m keen to have some to share with you, and also hopeful of adding more cool stuff to the list in future posts, should the year allow it. Good luck, all! Go out there and shine. You’ve got this, one and all! Oh, doesn’t time fly when you’re not paying attention, eh? You won’t have seen me much on here due to yet another lengthy state of flux. Now that I’m posting to say things are showing gradual signs of settling down now, I do have some fun announcements. First thing: early tomorrow, I’m getting on a plane to Dublin as a guest for Octocon! This is a great honour for me, and I shall be on several panels in my time there. I’m very much looking forward to it! Speaking of honour though, the following weekend sees me up in Leeds City Museum, performing a historical piece and portraying the amazing figure that is Walter Tull. If you’ve never heard of him, you’re probably not alone, but take some time to look up his story, I promise you will find it interesting at the very least. And I have a show on Saturday October 22nd entitled Know My Name for this precise reason. It’s Black History Month in the UK, and Walter Tull has a significant place in modern history. The images you see are from a field trip I took a few days ago to Sixfields, Northampton, of the memorial to him raised in 1999. But don’t just take my word for it, look him up! Big thanks to History’s Maid, by the way, for pointing this my way, so show some love! Finally, Book 3 of the Grenshall Manor Chronicles is in progress, though of course has been the victim of significant delays on my part, for which I can only apologise. The upside to it is that things I have come across in the delay time may well find their way into the book, and will only help things along. Let’s just say Tull’s story isn’t entirely unrelated. Many fans experience anxiety, whether as part of their daily life, in recurring bouts or just for one period in their life. However often a fan experiences anxiety, managing this at conventions and in online communities is a major skill. In this session people who have found their own ways through the difficult process open up about their own experiences. We’re surrounded by the bricks and mortar of the city itself, but what about all the alternate, futuristic, fantastical, or not-quite there Manchesters we know from SF and fantasy? A story does not exist in a vacuum. Stories are shaped by (among other things) the people they happen to, and characters are shaped by (among other things) the places they inhabit. How do SF and fantasy explore the inter-relationship of place, identity, and story? Which SF protagonists are uniquely tied to their places, and which SF places only make sense when seen by specific protagonists? If you’re terribly lucky, you might catch me helping out elsewhere. More likely though, you’ll catch me just wandering around the event. In which case, come say hi! I’ll be carrying those lovely business cards around, should you like one, and also will hopefully have a few copies of Oblivion Storm and Primal Storm available on the Newcon Press stand. They have a 5:30 pm book launch you should get to as well! There is a readings open mic on Sunday at 17:30 that I can be at if people would like to hear me do a reading of one of the two books, but you’d have to let me know first! I feel as if I’m guest writing on my own page, I’ve been away so long. But it’s all been for important reasons. I wouldn’t say good, necessarily, because some of them weren’t, though certainly there were reasons. Enough upheaval has occurred to move me across the country and things haven’t decided to settle down yet by any means. But it’s important to take this positively, because thanks to the support you’ve all given me over this time, I feel like really good things are about to be happening. Actually, I can go one better, and show you that they are! I meant to have this done in time for LarpCon, which I attended last month. A great venture, I can assure you it’ll be way different to every other con I go to this year. As well as all the wonderful live action roleplaying stuff you can buy, see, or talk about, there were also professional wrestlers this year! And they were wonderful! Look at me enjoying myself with this lot! [EDIT: See how this went down with the local press here]. From this, I did a talk, which I’ll be refining and redoing for a different audience when I return to Nerd East on the 11th of June. I promise you it’ll be a fun one—I mean, just look at some of the out-takes my friend D.A. Lascelles got for me! And by the way, you should check out his page anyway because it’s Vampire Month and you know you all want to. Remember I wrote for this last year? This isn’t in order of upcoming events for me though. Next up is actually Mancunicon. Some of you who follow my Facebook page will already have seen my lovely bee T-shirt. . . In addition to that, I am hoping to be in the incredible Adrian Tchaikovsky’s Dungeons and Dragons game for authors! AND…I get to reunite for a while with some of my Radio Book Worm team for what I can assure you will be a great live show. You should tune in! The tickets are exceptional value at £8/£6 concessions, and it is happening this weekend, and the next! Go and see it if you get the chance, and if you can’t make that particular show, then it is also playing at the Brighton Fringe. Oh yes – World Book Night 2016! I have been given books, and will be doing a thing, so watch this space! I suspect there will be other things this year I’ve either neglected to mention or not signed up for yet. And the big question I’m sure you all have, is where is Book 3? Well Winter Storm is in progress, I can tell you that, but due to last year being last year, got quite horribly delayed. You should have been reading (and reviewing it in some cases) now, but yeah, last year happened. Also, you may have noticed that mentioning Winter in your titles is a delay affliction for bigger authors than me. I promise you, I won’t be as happy to have had any of the series finished than this one, and I will ensure it has been worth the wait. I’ve had some art commissioned especially, but I want you to see it nearer the time of completion, and have something fun to do with the reveal too. Good suggestions of course welcome! That’s me for now, though I am definitely going to be blogging more regularly this year. I have a lot to keep track of, for a start! I may be heavily side-tracked on my own posts, but the guest blogs are of course coming in thick and fast! Today we have another member of Team Xchyler about to launch the second in the series of the Kingdom City saga and some fine, fresh sci-fi for you all. Before I wrote books, I thought to myself “I want to write something, but it needs to be cool.” I decided that epic items, like swords, are cool. And then those epic items being needed for something completely unexpected. It was around the swords Fury and Serenity that the entire Kingdom City universe grew. Admittedly, it’s a much more manual thought process than I’ve had with most of my other story ideas; they usually just come to me. But I don’t think that Kingdom City is any less rich or exciting for that. My little brother LOVES Dungeons & Dragons. Years before I called myself a writer, he was drawing a map for a campaign he was planning and I walked up behind him. He couldn’t think of a name for the capital city of the kingdom, so he called it Kingdom City. I thought that had an amazing ring to it so I stored it away for later use. Once you read the books, you’ll understand why they are subtitled Resurrection, and Revolt. I was most surprised by how dark it was. I was always fascinated by things that were a little dark and gritty, so I set out to create something edgy. Once I was done and I reread the book, I was taken aback by how dark it had actually become. Reading the first chapter again after not seeing it for several months made me think ‘oh gee, I wrote that?’ I think darkness in art is important to help us see the light and good in life. Though I believe some authors take that too far. R.R Martin is a prime example. I feel that artists that write darkness simply because it’s “realistic” miss the point of art. Finding time! I love writing and I love telling stories. I haven’t experienced writer’s block, so to speak. My mind it brimming with stories and ideas and the fountain hasn’t run down, let alone run out. As a worker and a father I did the only thing I could do to find time. Sleep less. Some weeks I was going on three and a half hours a night when I had to. I lean towards fantasy, especially urban fantasy. I get a rush when someone isn’t only smart enough to solve their problems, but they can also solve them with fire. Lots and lots of magically invoked fire. Who is your favourite author? Who has most influenced your work? Early on, I loved The Hobbit—it was the first big-kid book I read twice (One Fish, Two Fish, Red Fish, Blue Fish was the first little-kid book I read more than once). I read a lot of Asimov growing up, too. Just prior to my writing really taking off, I fell in love with Harry Potter. JK’s world is so colourful and engaging it’s hard to not fall in love. Today I’m an avid fan of Harry Dresden. The engrossing characters and thoroughly conceived world that Butcher has created is something I’m constantly trying to emulate. I’ve always loved creating. Probably the worst thing that happened to me is when I took a creative writing class in college. The professor told me that my story was the best thing he’d read “in a long time.” I’ve been spiralling since then. That story ended up being a scene of Kissed a Snake, in Xchyler’s A Dash of Madness short story anthology. My brain is full of story ideas and it hurts when I don’t let them out. Writing isn’t a choice, it’s a compulsion. And two short stories. Kissed a Snake in A Dash of Madness anthology, and Fairykin in Moments in Millennia . Kingdom City part3. Working title is Retribution. 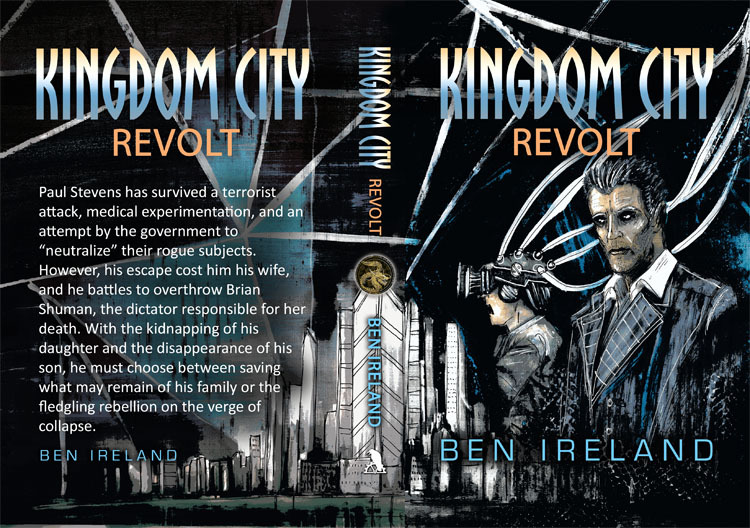 The original working title was Redemption, but that sounded way too optimistic for Kingdom City. I want my readers to get to know me through my work. Please pick up any of my stories and see what you find. Today is a busy day for parties and celebrations. 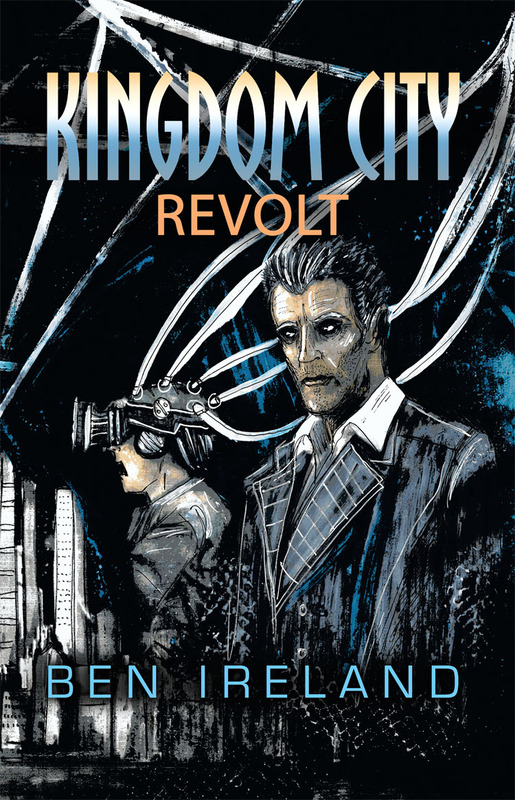 And now for the next installment in the Kingdom City series – Book 2: Revolt! Finally, want to know a little more about Ben? Ben churns out his prose from his home in Southeast Texas, where he lives with his wife and three children, and works in IT. When he isn’t writing, he’s either thinking about writing, or he’s driving his winfe insane talking about his novel ideas. 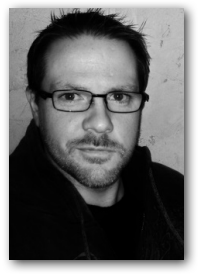 His work has appeared in two X-anthologies: “Kissed a Snake” in A Dash of Madness: a Thriller Anthology (July 2013), and “Fairykin” in Moments in Millennia: a Fantasy Anthology(January 2014). His first novel, Kingdom City: Resurrection was published in February 2014.